The Vermont State Colleges' board of trustees vote on whether to increase or freeze tuition at the trustee meeting Feb. 20 in Stearns Performance Space. 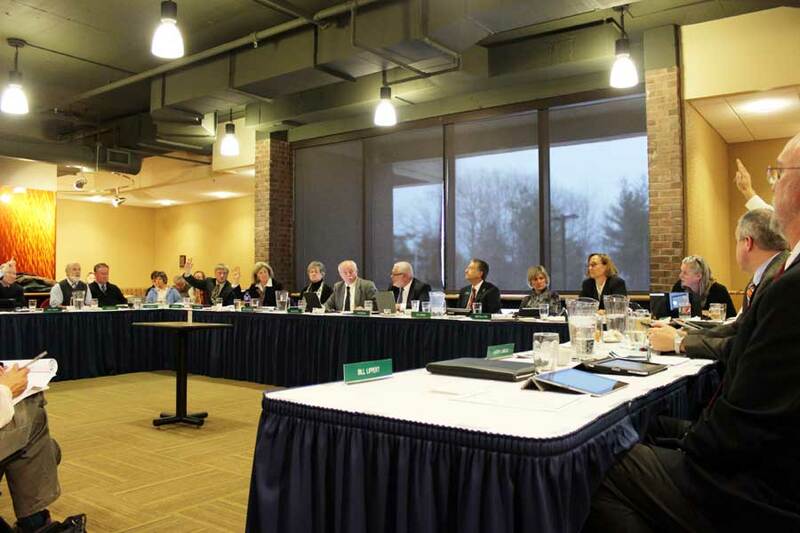 At the Vermont State College board of trustees meeting Thursday, Feb. 20, trustees approved a 3 percent tuition increase for the 2014-2015 academic year, rejecting a recommendation from its own Finance and Utilities committee, which voted 4-2 last week for a tuition freeze. The 8-5 vote to approve the 1-year increase followed a 50-minute discussion that led to the defeat of three other resolutions, which included a proposal for a one-year, zero-percent increase, also known as a tuition freeze; a 2-year, 3 percent increase proposed by VSC Chancellor Tim Donovan; and a proposal made by student-trustee Colin Santee for a 1-year, 2 percent increase. O’Connor supported the college presidents’ and Chancellor Tim Donovan’s original proposal for a 3 percent tuition hike for two academic years, but it was met with opposition by others who didn’t want to commit to a 2-year hike. She later agreed with opponents on a 1-year hike, but urged them to come to a consensus on the long-term finances, and to seek other sources to fund the system. Everyone agreed that the state government would not be a valid source as it hasn’t been doing enough for the state colleges in terms of funding for years. Dickinson said she supported the tuition freeze because it would send a strong message, and would give students a chance, for one year, to hold their own. Karen Luneau said the tuition freeze would be “attention getting,” but it would cause a tailspin for each of the schools. She said the trustees need to make an honest assessment of the VSC system, and consider what their mission is. Then they must decide what parts of the system no longer fit the mission and require further assessment. Michelle Fairbrother said that neither a tuition increase nor a tuition freeze would solve the financial problems the VSC is currently facing. “It’s not meant to penalize the Vermont State Colleges, penalize the presidents, students, or the VSC system, but I truly believe it’s time for a change,” she said. Under the resolution finally adopted, tuition will rise on average 3 percent for the 2014-2015 academic year for in-state and out-of-state students within the VSC. For in-state students at Johnson State College, that means an increase of $288, from the current $9,312 to $9,600. At the end of the meeting, when the public was allowed to comment, Johnson State College student Liz Beatty-Owens expressed concerns that the increase would present a hardship for students and some will be unable to return due to the rising cost. She urged the board of trustees to work with students toward a better, self-sustaining solution for everyone.